This is what’s left of the Notre Dame Cathedral in Paris. A fire ripped through the historic building Monday. The French president is promising to rebuild. An investigation is underway to find out how the fire started, but an accident during renovation work is suspected. 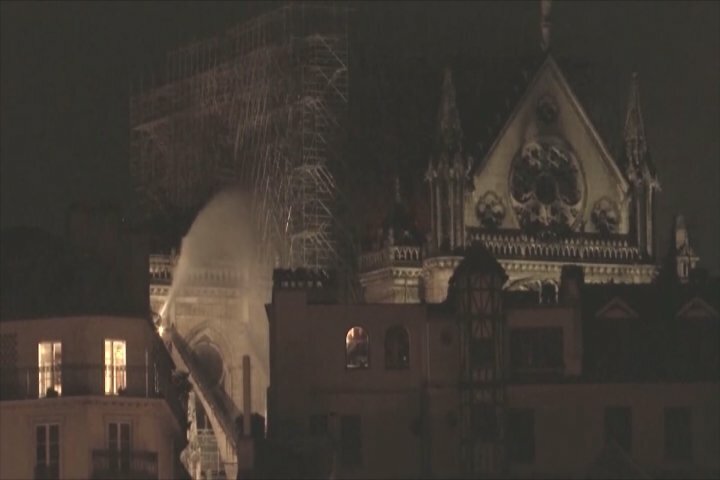 The centuries old cathedral lost its spire and roof, but its famous towers were saved from the fire. Rebuilding will likely take years, and French President Emmanuel Macron says it will take international help. The Notre Dame Cathedral is an international landmark. Here’s a bit of historical context on why the building is so important and beloved around the world. Construction on it began about 900 years ago. It took more than 200 years to build, and finally finished in 1345. It brings in a hefty 13 million visitors a year, and is the seat of the archbishop of Paris. Its famous towers stand at 223 feet high. The spire once stood at 300 feet, but collapsed in Friday’s fire. It is also considered one of the best examples of French Gothic architecture.